Guru is an omni-channel knowledgebase for support, sales, and marketing teams. It is available where your users are in different forms: as a browser extension, a web application, and a Slack bot. Whichever channel your workforce chooses to access Guru they can view the most up-to-date knowledge aggregated from both internal and related external sources. As such, they are able to apply solutions and remediation actions confidently. But Guru is more than a knowledge unification platform. It has a publishing API and turnkey solution that allow you to be flexible. This means that you can either build your own branded knowledge base or power your existing external sites with the application. Maintaining multiple knowledge bases stresses your team and makes it harder for your workforce to retrieve the information they need. With Guru, you can bring data from disparate sources together in a single platform to allow your personnel to find answers to their queries rapidly. Your company’s knowledge and solutions grow every day. Because of that, it is increasingly important to make certain that staff have access only to the best and most up-to-date articles. Guru can help you with that as it has a built-in knowledge verification workflow that automatically notifies you when it is time to review and revise content. Guru provides you with actionable data regarding how users utilize your knowledge base. You can also employ the application to identify trends in searches. With the insights you glean, you can improve your content and advance your knowledge strategy. Unlike other knowledge management applications that focus on wikis, Guru puts information at your workforce’s fingertips wherever they are. They can search and view information from their browser’s extension or interact with a Slack bot to find relevant articles. With these options, your agents have documentation and knowledge integrated with their workflows. Moreover, Guru offers you two methods for publishing knowledge content. You can use its publishing API to power your existing knowledge base or you can employ the turnkey solution to build from scratch your branded information portal. 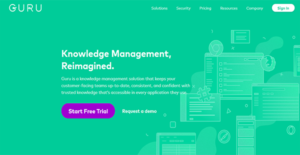 If you are considering Guru it might also be a good idea to check out other subcategories of Best Knowledge Management Software gathered in our base of B2B software reviews. It is essential to note that virtually no software in the Knowledge Management Software category is a perfect solution able to fulfill all the requirements of various company types, sizes and industries. It may be a good idea to read a few Guru reviews first as specific solutions might excel exclusively in a really small set of applications or be designed with a really specific type of industry in mind. Others can operate with a goal of being simple and intuitive and as a result lack complex features needed by more experienced users. There are also solutions that support a wide group of customers and provide a rich feature set, however this frequently comes at a more expensive price of such a service. Make sure you're aware of your needs so that you pick a service that has exactly the features you look for. How Much Does Guru Cost? Guru offers the following enterprise pricing packages for users to choose from. Give the details a look, and select the best plan for your business. We realize that when you make a decision to buy Knowledge Management Software it’s important not only to see how experts evaluate it in their reviews, but also to find out if the real people and companies that buy it are actually satisfied with the product. That’s why we’ve created our behavior-based Customer Satisfaction Algorithm™ that gathers customer reviews, comments and Guru reviews across a wide range of social media sites. The data is then presented in an easy to digest form showing how many people had positive and negative experience with Guru. With that information at hand you should be equipped to make an informed buying decision that you won’t regret. What are Guru pricing details? What integrations are available for Guru? Guru can integrate with CRM systems and support applications. If you need more information about Guru or you simply have a question let us know what you need and we’ll forward your request directly to the vendor.